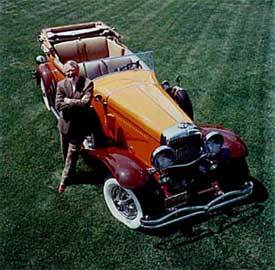 Clive Cussler next to one of his favorite classic cars, a 1929 Model J Dusenberg, featured on the back cover of FLOOD TIDE (©1997). Come on, admit it – do you know who Clive Cussler is? How about Dirk Pitt? How about NUMA? I thought so. With over 16 novels to his credit, Clive Cussler should be as popular as Tom Clancy and John Grisham… but he’s not. So read our exclusive EON interview with the author who should be more famous. After gushing about how much I enjoy his books (yes, I’ve read every one of them and loved them all), Clive Cussler gushed right back that he loved the fact that I gave ATLANTIS FOUND, his most recent book, such a nice review. It’s always good when you hit it off with the person you’re interviewing. We began talking about ATLANTIS FOUND and how he ever came up with the idea for the book. So there. But what about the tie to World War II, Hitler and a secret base way up north? 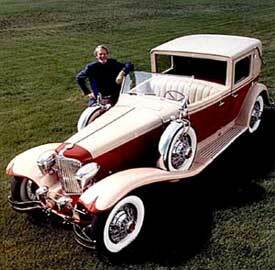 Cussler ready to take Dirk Pitt's 1932 Stutz for a spin, featured on the back cover of DRAGON (©1990). Let’s go back a few years — 30 to be exact — to the creation of Dirk Pitt (the main character in all the Cussler novels) and the books. “My son’s name is Dirk and I was looking for a good, tough name and there it was,” Cussler says. “He was only 6 years old when I started writing [in 1965] and I was working in advertising at the time as a copy and creative director for an agency in Los Angeles. My wife would go through cycles where she would get bored and would get a job when the kids were in school, then she’d get bored with that and stay home for a while. As simple as that. But what would he write about? Cussler didn’t have that “great American novel” inside of him, but he thought it might be fun to do a paperback series of adventure, mystery, intrigue. So he began researching what was out there, from Edgar Allan Poe’s “Inspector Dupont” to James Bond, Travis McGee and Sherlock Holmes. But then he began to wonder how he could make his book and character different. “Then it hit me – I’ll take my hero and put him in and around water, because I’d been scuba diving for years and I thought it’d be a great backdrop,” Cussler exclaims. And that’s how Dirk Pitt was born. 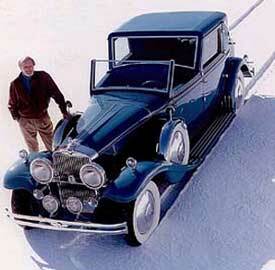 American Graffiti meets Cussler's SAHARA (©1992) and his 1936 Avions Voisan. What most people don’t know is that the first book of the Dirk Pitt series was PACIFIC VORTEX, even though it was actually published later. This is where Cussler introduced all the characters, setting the action in Hawaii and telling the story of this evil old guy who lived under the sea. Long story short, Pitt fell in love with the guy’s daughter and she was killed. Then throughout all the books, sometimes this long-lost love is mentioned — gotta have that romance factor! The real-life Dirk still remembers that period of his life vividly – Cussler’s desk and typewriter were in his room and he’d fall asleep to his dad pounding away on the typewriter. But with this success, fame did not come. At least, he did not become “famous” with his name in the media eye and known in every household. 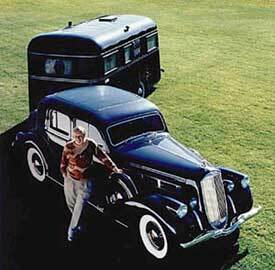 Ready to travel on his next trip, Cussler and his 1936 Pierce-Arrow & Travelodge Trailer, featured on the back cover of INCA GOLD (©1994). But it is a shame, and brings us to the question: Are you ever going to do another movie based on one of your books? I can almost hear Cussler cringe. Actors pounding on his door? And who would that be? But Cussler doesn’t want to answer that just yet. However, Cussler still doesn’t sound convinced, and he wouldn’t comment on my suggestions (which I listed at the end of my book review – Sam Neill or Timothy Dalton. So if Cussler had his choice, script and actor approval, which book would be a movie? 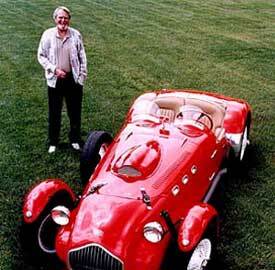 James Dean has nothing on Cussler and his 1953 Allard, featured on the back cover of SHOCKWAVE (©1996). Now, you may be asking yourself, what the heck was the NUMA mentioned at the beginning of this interview? NUMA is the National Underwater & Marine Agency, the fictional organization created by Cussler that Pitt and his cronies work for and that always gets involved in Pitt’s adventures, whether NUMA wants to or not. Most people don’t know that NUMA is also a real-life organization formed in 1978. Looking for shipwrecks around the world, Cussler has found many thought to be lost forever. One of the most recent was the Confederate submarine Hunley, the first to sink a warship off Charleston during the Civil War. When found buried three feet down, a port was broken and they found that silt had filled the submarine, which means the bones of the crew may be intact. In July, the Hunley will be raised and yes, Cussler will be there. The most recent wreck NUMA has found was this past December: the Carpathia, the ship that rescued the Titanic survivors, which was torpedoed six years later in World War I. They managed to get a camera down to film some of the wreck, but the weather beat them out, so they’re returning in April 2000. Cussler stepping out in style with his Cord L-29, featured on the back cover of TREASURE (©1988). 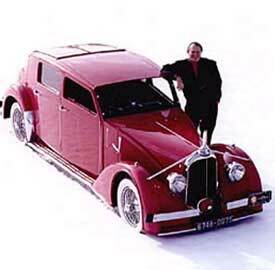 If you think that doesn’t keep him busy, ask Cussler about his classic car collection and the coffee table book about classic cars he’s planning for a December release (just in time for Christmas!). With 87 cars in his collection, his favorites are a 1929 Dusenberg (“the epitome of a classic car,” he enthuses) and a 1948 Talbot Lago (“beautiful, it’s gorgeous.”) One of his classic cars is always featured on the back cover of his books, with him standing next to it, looking like the contented author he is. So what’s next for Cussler? “In the next book, Pitt discovers Captain Nemo’s Nautilus, although I still have a long way to go in fleshing out the plot,” he reveals. “And NUMA heads to Fire Island, New York this summer, where the Savannah, the first steamboat to cross the Atlantic, is buried in the sand.” Cussler says he’d die happy if he could just find the Bonhomme Richard, John Paul Jones’ ship – the one that started NUMA. He’s gone looking for it three times and plans to give it another go this year. Maybe that will be Dirk Pitt’s next adventure. I am an avid reader of all sorts of books, articles and even lables on cans & boxes. This article on Cussler, one of my favorite authors, gave me more information on him than I had before. What a guy. I live on an island in the San Juans and love the water even if I can’t get in it. Too cold. As I was reading “Inca Gold”, I suddenly pictured Burt Lancaster and Nick Cravat in the roles of Dirk Pitt and Al Giordino. What a picture that would have been. I’m hooked and cannot get enough. Love the suspense, the characters and the humour. Best of all a man who does not have to use bad language to express himself. Thanks for that.